The nail edit that launched with YSL’s urban inspired autumn collection, Electric Chic, is absolute perfection. A trio of modern classics, these beauties deserve a home in any make up collection – and of the three, my favourite is happily the one they sent me, No 38, Gris Underground. Although I haven’t ruled out snapping up the other two, come pay day! In an unusual burst of planning/organisation, this weekend I packed away my summer polishes and displayed my favourite autumn colours on my shelves; Gris Underground took pride of place and I couldn’t wait to get it on my nails. Described as ‘a chic blue-grey that is as captivating as the Paris sky’, this subtly changes colours with the light – sometimes it’s more of a pastel blue, at other times a concrete grey, and on occasions there is a definite lilac sheen. I like these nail polishes – the brush is nice and wide, so the product applies evenly in one or two strokes. It was opaque in two coats, and has been on my nails for three days now with no sign of chipping. Drying time is about average but, as always, I used a quick drying topcoat to help it on its way (Sally Hansen and Seche Vite are my all-time faves). I’m rather smitten with Gris Underground, I must confess – I think it’s very chic, and pairs equally as well with autumn’s richer, more dramatic lip colours, as it does with this season’s lovely, neutral, minky/taupey colour palette. This is €24 and on counter now; are we liking? 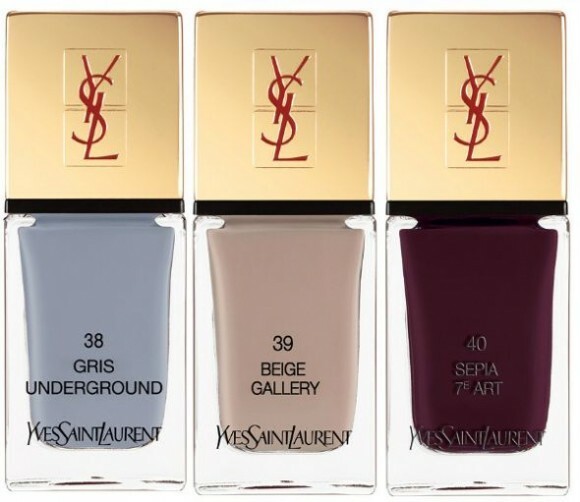 Aren't the YSL polishes just lovely? In my experience they're almost opaque in one coat. I just adore the one you've got there - I've been sporadically eyeing it at work - it's like the "new" taupe that everyone was after a couple of years ago, only people haven't discovered yet just haw classy and chic this particular hade of gray is. Gorgeous colours, I'm soooo in love with Gris Underground! I love all the shades. That Gris Underground is definitely the perfect fall color. That is a beautiful colour, it satisfies my love for blue polish but grey enough to make it Autumn appropriate- love it! I love it Emma! I have tow similar shades Revlon's Hazy and Essie's Cocktail Bling. Must get them out again for Autumn. It's such a chic colour! I want to know how that Sepia one turns out because I am always on the hunt for the perfect burgundy/blood red color! Gah! Must... not... buy..it! Oh, buggrit, where's my laser card?? They make great nail lacquers. Very pretty shades. Wow, that blue-grey polish is amazing! I have this burgundy color my stepcousin from Paris bought it for me I haven't tried it yet but this will be the next color my next mani. I think this is a lovely color. Very pretty for Spring. I have been using quick dry drops lately. They seem to help speed up drying. This is a truly lovely hue, unique and does remind me of a stunning overcast sky. I appreciate your visit hun! Happy Friday! I have never tried YSL nail polish. The colour looks really great. Oh I like this a lot!! 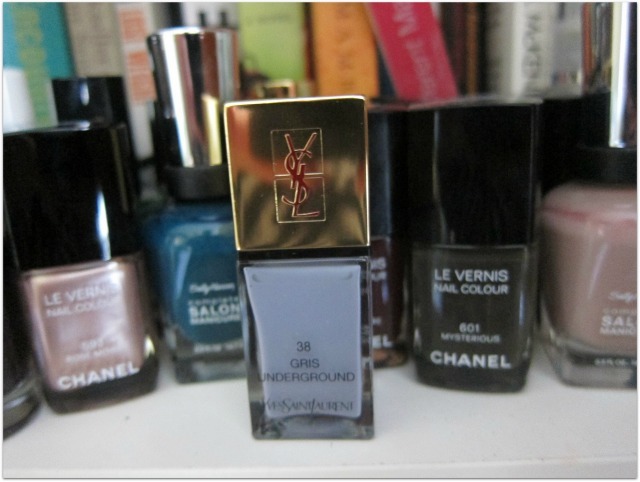 I think that YSL nail lacquers are always so sophisticated! I'd love to try that grey shade!